To the City of South Orange and LCOR Incorporated for promoting pedestrianism, respecting the local vernacular, maintaining an appropriate scale, and creating visual interest in South Orange. Driving westbound on South Orange Avenue, a traveler traces the path of suburban expansion along a radius stretching from downtown Newark, through the Oranges, to its tree-lined terminus in Livingston. Connecting central Newark to its nearest neighbors, South Orange Avenue has long been one of the most crucial commercial thoroughfares in Essex County, and the heart of the Village of South Orange. The Avenue shares its approximate trajectory with New Jersey Transit’s Morris and Essex line. South Orange’s attractive, stately train station serves as the anchor for a lively town center, and a focus for the many commuters who live within easy walking or driving distance to it. But despite their parallel courses, road and rail have not always been successfully integrated in South Orange, or elsewhere along the Morris and Essex line. During the 1960s and 1970s, development efforts focused on the expansion of quick and heavy automobile access along South Orange Avenue, and the area surrounding the train station was allowed to lapse into relative disrepair. South Orange found itself in danger of becoming a “corridor city” – a drive-through municipality with little identity of its own, its small stores and restaurants lost in the blur of speeding traffic. Beginning in 1993, a coalition of South Orange civic leaders and municipal organizations committed themselves to revitalizing the village and resisting its slide into the dysfunctionality that is characteristic of other inner suburban areas. This coalition, which included Village President Bill Calabrese, the Village Council, and the South Orange branch of Main Street New Jersey, identified the train station as a site of traction for their efforts. They understood the restoration of the balance between road and rail as a crucial element in civic renewal. Capitalizing on the opening of the direct Essex County rail link to New York Penn Station, Planning Board Chairman Angelo Bianchi contracted with Lawrence Houstoun of The Atlantic Group and Brown Keener Urban Design to develop and execute a multifaceted redevelopment strategy for South Orange – one comprehensive enough to redefine the Village as a haven for commuters and perhaps even as a destination for shoppers; a town friendly to train riders and pedestrians as well as motorists. The complete plan, which is currently in process, called for an overhaul of South Orange Avenue, the reorientation of several streets from automotive to pedestrian use, construction of 200 commuter-specific residential units, a new performing arts center and meeting space, a grocery market and other independent retailers, eventual renovation of the train station itself, and thoroughgoing cosmetic alterations meant to generate a profound feeling of uniqueness, walkable space and manageable scale, and small-town charm. The overall cost of the plan will eventually total more than $57 million, raised through contributions from the Community Development Block Grant (CDBG) program and the Essex County Improvement Authority, the Essex County Loan Programs, Main Street New Jersey and a small retail tax hike. The station – a coherent marker of South Orange’s status as both a destination and a locus of discrete interest along a continuum of suburbs – served as the evident and initial focus of these efforts. Sloan Street, immediately adjacent to the station, had essentially been little more than a congested parking lot and visually unappealing and featureless drop-off area; the few retail establishments abutting it suggested the impersonality of strip-mall development. Thoroughly re-imagined by Houstoun and traffic consultant Ray Hodnet, the street has been converted into a comfortable public plaza replete with flowerpots, benches, and tables; the renovation has attracted a bakery, a florist, a Starbucks coffeeshop, and other businesses to a handsome retail center with harmonized signage and storefronts and large, brightly lit windows. A plaza highlight (which will eventually be extended over the balance of South Orange Avenue) is the comforting presence of pedestrian-scale street lights in the fashion of South Orange’s famous gas lamps that still light many residential blocks throughout the Village. The installation of these lamps simultaneously replaces the impersonal orange cobra lights that suggest automotive supremacy, and contribute to the quaint, insular, small-town feel that South Orange seeks to generate. Encouraged by the city plan, developer LCOR Incorporated is completing a 200-unit residential construction adjacent to the train station. Appropriately named Gaslight Commons, this attractive apartment complex incorporates many architectural elements suggestive of South Orange history and identity. Proximity to the station and the redesigned Village downtown makes the Gaslight Commons an ideal address for commuters. The complex has been constructed on the opposite side of the train station from the downtown renovations, and helps to tie the residential west side of the Village into the redevelopment concept. LCOR Incorporated, owner, operator and developer of the Commons, is a national company with a commitment to intelligent urban design and a history of collaboration with municipal governments to create better places that include defining architectural elements. A luxury apartment complex like Gaslight Commons helps to further diversify the urban core and offers a community to support the merchants of the downtown area. The project will bring the city $500,000 in yearly payments in lieu of taxes. The “taming” of South Orange Avenue, once over-designed for vehicular traffic, has been a spectacular success by any standard. The formerly daunting four-lane roadway has been converted into a manageable city street of three lanes with cross walks, including a central turning lane. The sidewalks have been widened substantially, and they have been furnished with trees, creative landscaping and benches. The newly uniform look of the town center serves to harmonize the redesigned downtown district with the train station, the residential units and the site of the forthcoming performing arts center into a medley of pedestrian functionality. “It’s now imaginable that South Orange can be a trip, rather than a stopping-point between Newark and the Morris County suburbs,” says Main Street Director Nancy Adams-Shippey. 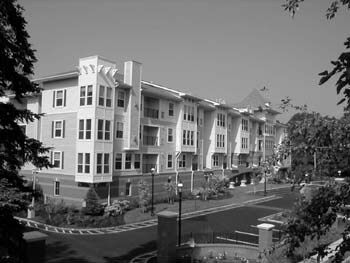 The plan respects the local vernacular, seeking to reincorporate authentic and characteristic elements of South Orange design as affirmation of the town’s unique identity. By converting unappealing streetscapes into attractive sites of public congregation, the plan creates lively visual interest in a town that had drifted toward catering to rapid automotive transport thought uninspiring functionality and disregard for close study of landscape. But most importantly, the South Orange redevelopment plan creates a pleasant, appropriate and manageable sense of scale, balancing road, rail, and sidewalk to transform an auto-sized city into a human-sized village. As one might expect, not all property owners within the redevelopment area supported the redevelopment plan and its proposed improvements. Recently, in the case of Forbes v. Board of Trustees of the Township of South Orange Village, the New Jersey Appellate Division considered a challenge to South Orange’s redevelopment plan. In Forbes, the Appellate Division strenuously upheld South Orange’s redevelopment efforts and ruled that “there was substantial evidence that the Village’s central business district as a whole was becoming stagnant, deteriorated, obsolescent and that its economic vitality was seriously declining,” and that measures to reverse that decline were warranted. The Court held that the Village had met all necessary legal criteria and that the area was in definite need of productive redevelopment. This decision will certainly make it easier for other municipalities to adopt or implement redevelopment plans and may deter future litigation which can delay or halt a comparable proposal.